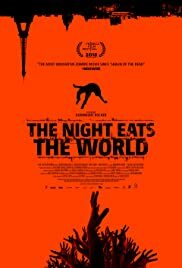 The curiously titled The Night Eats the World is a french zombie movie, though to appeal to the masses was filmed in English. It tells the story of a man who falls asleep at a party only to wake up to a zombie apocalypse. If you're expecting an action packed bloody zombie movie, this simply isn't for you. The movie takes a simple and rather realistic approach, namely one man alone and what he does to pass the time while the world around him turns to chaos. Early on I was impressed, it was looking like this might be a likeable zombie affair but sadly the quality dips and it falls into the grindy repetitive and excessively depressing category. The film has its moments but when the credits roll you'll likely be very aware that this movie will be gone from your memory within a week. It's all just so very underwhelming and ultimately goes nowhere. I'd say nice try, but I'd be lying.